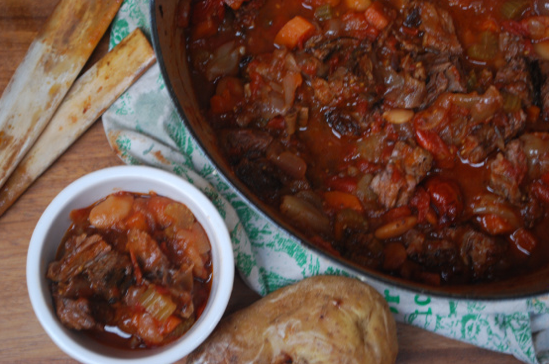 I don’t often cook with red meat but when the weather turns cold, and the dark nights draw in, I can’t resist making this hearty stew. 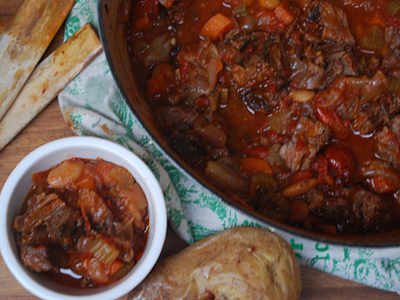 I love the depth of flavour and tender meat you get in this dish from slow cooking. 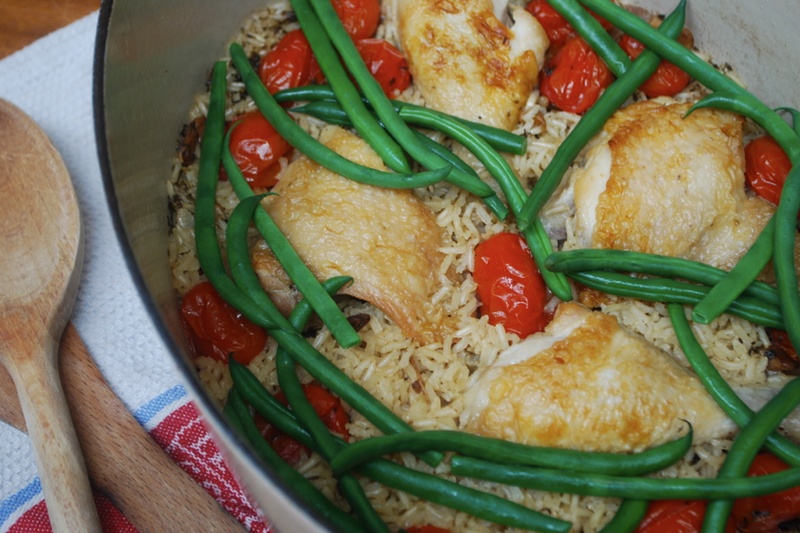 It does contain quite a few ingredients but once the prep is done it really is a matter of just leaving it to cook in the oven and forgetting about it whilst you get on with other things. 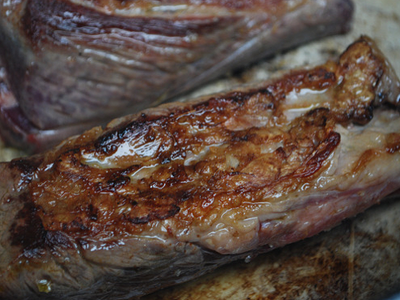 You can get short rib from your butcher and as it isn’t as popular as other beef cuts it is reasonably priced. 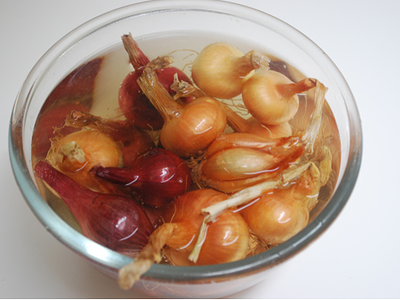 It has great flavour and as the pieces are larger than normal diced stewing meat it is quicker to brown. 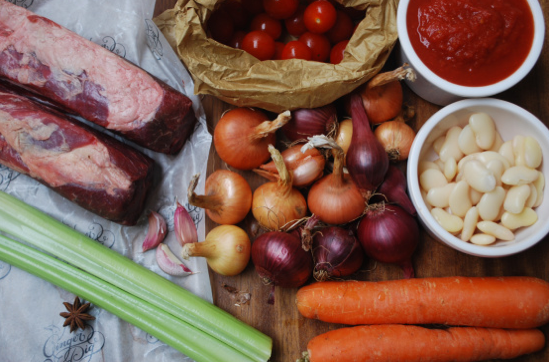 Beef is a lovely rich source of iron, vital for blood health and energy levels (iron helps to oxygenate our blood). 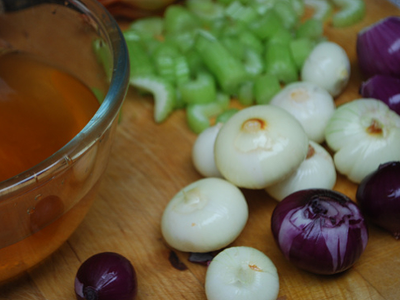 There are also plenty of natural antibacterial foods in this stew, such as garlic and shallots to help fight potential winter bugs. 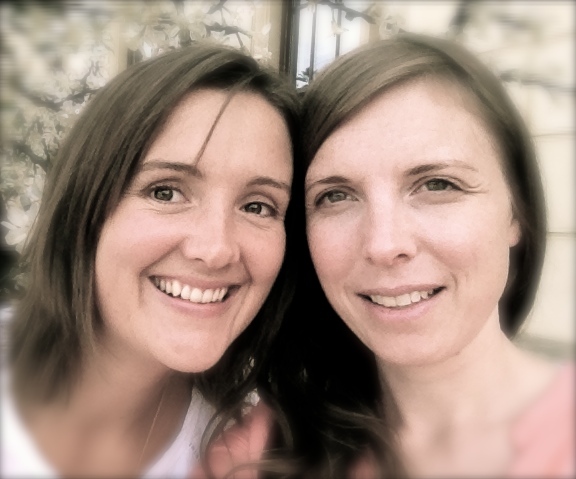 The carrots and tomato provide a further immune boost with plenty of vitamin C and A. 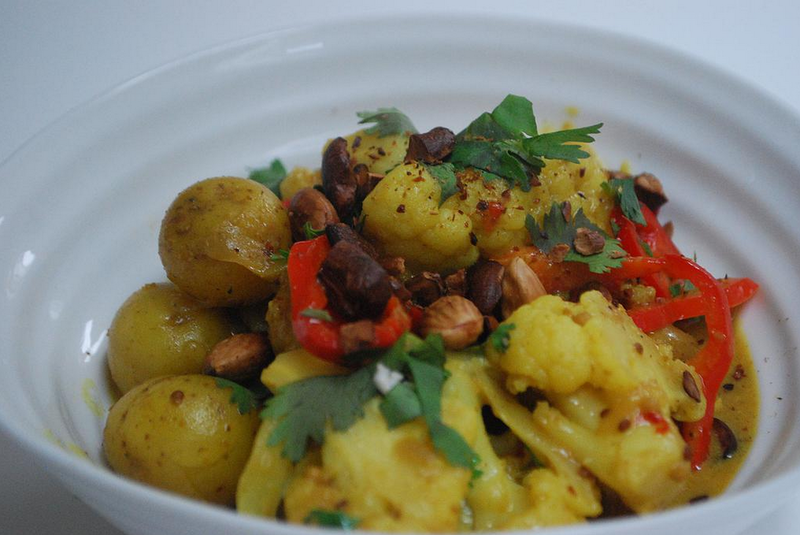 It is a lovely warming dish, perfect for autumnal days and provides a fantastic family meal. 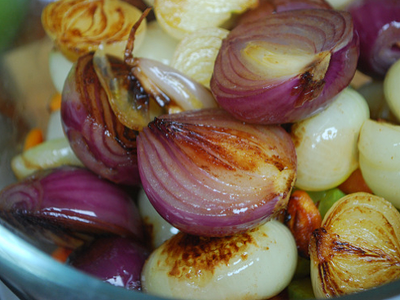 Take the onions out and pop into a bowl while you get on with browning your carrot and celery. Add a touch more oil if the pan dries out. Take them out and add to the onions. Season your short ribs with salt. If your pan is looking dry add a small drizzle of oil. Add the meat to the pan. You want the pan to be hot enough to hear that sizzling noise. Brown the meat all over until it turns a deep brown colour. You are just browning at this stage not cooking. Getting colour like this equals a real depth in flavour for the finished dish so it's worth being a bit brave and taking your time. 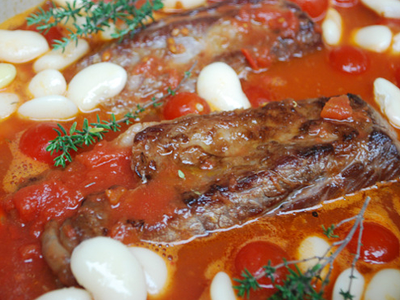 Take your meat out while you cook your garlic for a minute and add the tomato puree. If the pan has any bits stuck to it add a splash of water to help lift them off by scraping with a wooden spoon. 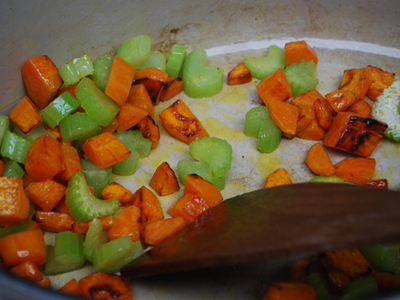 Add all the vegetables back to the pan with the chopped tomatoes and the 400ml of water. Add the butter beans and baby tomatoes. (If you don't have baby tomatoes then add another carton or tin of chopped tomatoes and only add 200ml of water). 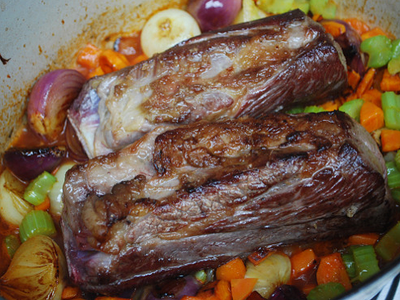 Place your beef short rib on top nestled nicely in the vegetables and juices and add your star anise. Bring the mixture up to the boil. (If you have a few sprigs of thyme sprinkle them on). As soon as it starts to boil turn the temperature down to a gentle simmer, place the casserole lid on top and put in the oven for at least 2 to 2½ hours. 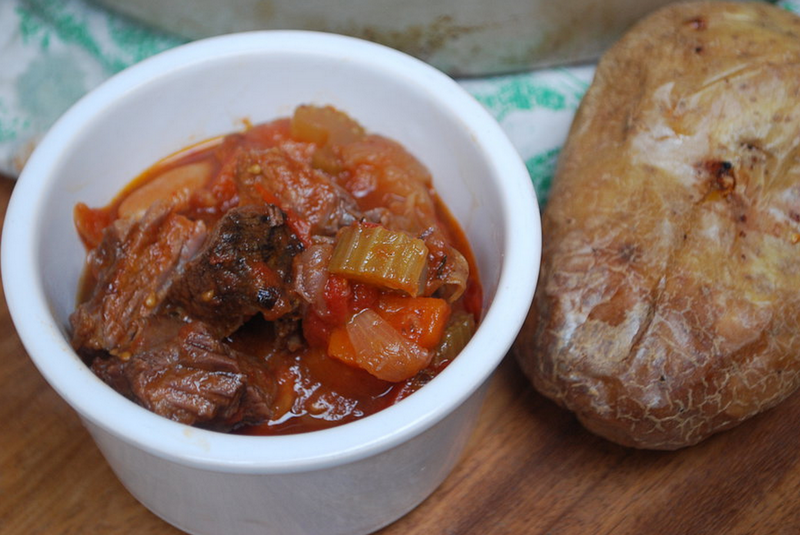 You want the stew to just be bubbling gently, not vigorously or this will toughen the meat. Take it out of the oven and look inside. 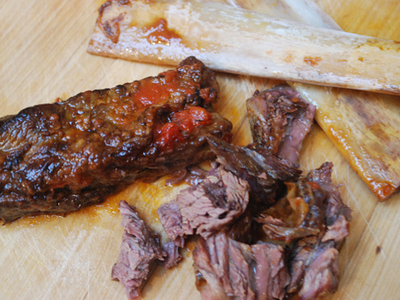 The meat should have shrunken off the bone and literally fall of it. If it is not yet this tender put it back for a bit longer (and make sure your pan is not at a vigorous boil). Take the meat out and slice into mouth-sized pieces. 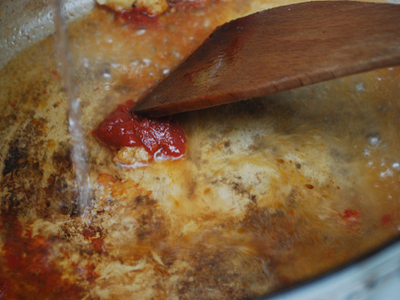 Whilst doing this, if the sauce/rest of the stew looks a bit too watery, or if the flavour has not developed enough, pop it onto your hob on a high heat and allow it to reduce until you are happy with it. This could take 5 minutes or 30 depending on the depth of flavour you want. 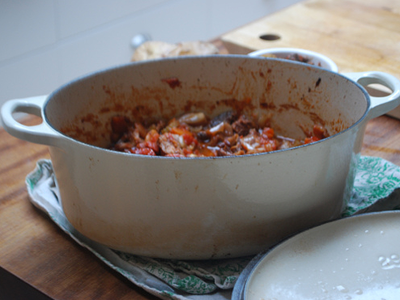 Add the meat back to the casserole dish, combine and season. 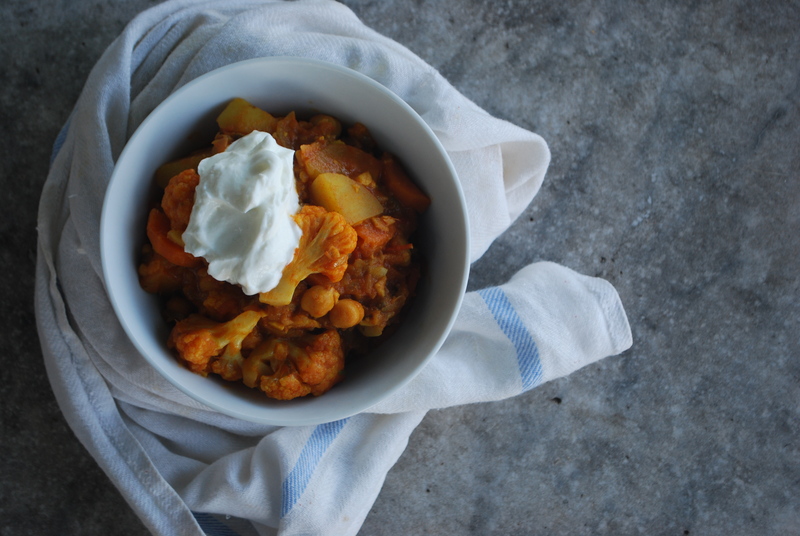 Serve with a baked potato and freeze any leftovers for another cold autumnal day.